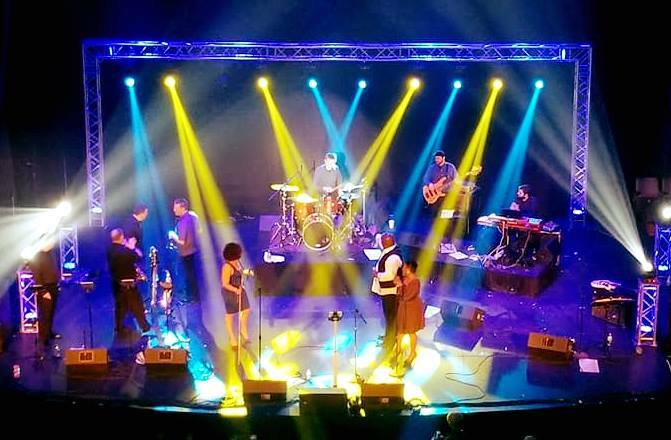 DIXON, IL – A large brassy blues and funk ensemble should be supported by a bold lightshow that covers the stage with intense, colorful and fast-moving light, believes Jeff Hinton. 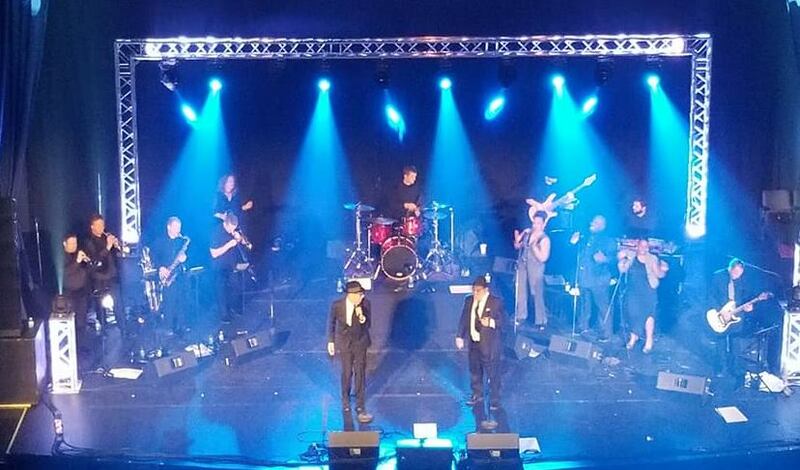 The owner of 815 Productions, Hinton put this theory into practice in late April, when he lit a benefit show by Late Nite Blues Brothers and 10 of Soul with a beefy high-octane lightshow, created with a collection of 14 CHAUVET DJ Intimidator fixtures. With its high-domed ceiling and deep stage, the historic Dixon Theatre, where the benefit was held, and which was the beneficiary of the fundraising concert, did not offer the hanging points that Hinton was seeking. To get the proximity he wanted, he erected a 28’ goal post on stage. Aside from the goal posts, Hinton also had four 3’ truss totems, located two apiece, stage left and stage right. He positioned four Intimidator Spot 255 IRC moving fixtures on these totems and relied on them primarily for side lighting as well as for aerial effects. In addition to the four Intimidator Spot 255 IRC units arranged on the truss totems, Hinton flew 10 Intimidator Beam LED 350 fixtures on the overhead section of goal post truss. Throughout most of the evening, the overhead fixtures were directed down at the performers and used for specials or to create colorful gobo patterns on the stage deck. On some songs, Hinton directed split beams from Intimidator Beam LED 350s on individual performers to frame them in a multi-dimensional cone of light. On that evening, the blues, soul and funk ensemble raised critical funds to continue the process of upgrading the community-owned Dixon Theatre, a historic gem that traces its roots back to the 1920s and boasts several notable architectural features, such as its domed ceiling. Thanks to an inspired performance and dynamic lightshow, supporters of the theatre enjoyed great entertainment and helped to ensure that this important part of their community will glitter even more brightly in the future.